(b. 1978) – a poet, a botanist, a visual artist and a musician, an assistant professor at the Independent Department of Forest Botany of the Warsaw University of Life Sciences. Her debut poetry volume Atomy [Atoms, 2014] was nominated for the Silesius Wrocław Poetry Award in 2015. 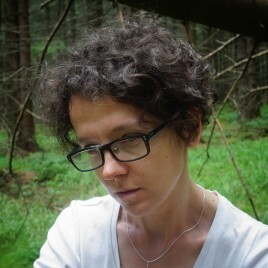 She runs a popular science portal botanik.pl. In her works, she tries to erase divisions between natural and human sciences and to develop new languages of description of the human-nature relationship. At the beginning of 2017, her new poetry volume will be issued by the Warstwy publishing house from Wrocław. She is also preparing a book on plants in collaboration with the Marginesy publishing house.